Larry, just read the blog info. My sister Julie told me about the planned ceremony. I was unable to attend, but reading this blog and all the responses was very touching. I just wish I could have been there to share this with the family. I was at Arlington Cemetery last year. It was a moving experience even if you didn’t know anyone buried there. Now if I go again, it will be even more inspiring. Thanks for all you investigating. I am sure your Mom was overwhelmed with sadness and pride. I wish my Mom could have lived to be here too. Hope to see you at the next Rafferty picnic. Thank you Kathleen. Thank you for joining us. It meant a lot to my Mom to have you there. My name is Linda Vincent and my father, Capt. Roger S. Vincent, was on the C-124 Globemaster as was his friend Walter Peterson. Walt’s son Barry sent the blog to me. 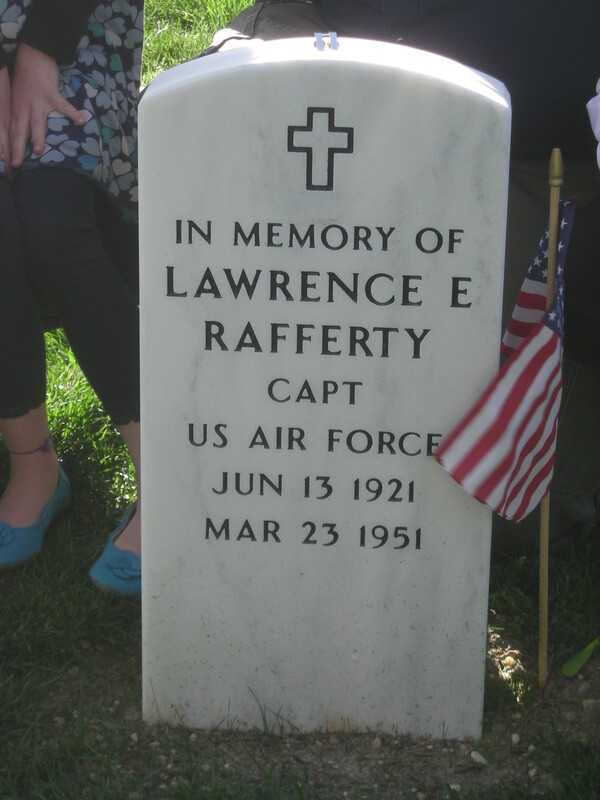 I was touched beyond words by Larry Rafferty’s report of the service at Arlington. I just wish I could have arranged such a service for my dad before my mom passed away. I am grateful to Larry for sharing the experience and to all who responded with such kindness and compassion for our loss. Thank you. Thank you Marilyn and anon! Rafflaw, I just noticed, and I have no idea why, that the wikipedia contains no information at all on 49-0244, even here on this page Douglas_C-124_Globemaster_II#Accidents_and_incidents. Perhaps you may wish to add to this section or better, create a page dedicated to that airplane, her final flight and her crew. I am glad to know your father was memorialized at Arlington and that your family have achieved some closure with it. I just read your blog sent by my brother, Barry Peterson, and I sat here tears rolling down my cheeks as I read the entire tribute. Our fathers were TRUE HEROES and they finally received the recognition that they long deserved after 61 years. Thank your for your story AND God bless you and God Bless our Fathers and those other men that lost their lives that day and God bless ALL our Servicemen that defend the United States of America!! I am extremely proud & elated that I was a participant of those who were able to attend your fathers (my uncle) services and to represent my father. It was the most beautiful service I have ever witnessed. I know your father was looking down from above with pride & love of his family. The memories of the memorial will be with me forever. Thank you for sharing this information and I hope it was some kind of closure for the family. Wonderful to read this story about the Uncle Larry I never had the pleasure to meet. I am Joe & Elenor Raffertys daughter. What a beautiful event this must of been. I am so sorry I did not have the good fortune to attend.